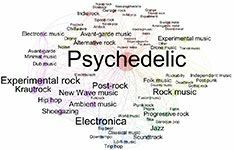 Psychedelic music often times referred to as “Psychedelia” includes several prominent music variations and genres in line with psychedelic culture that sought to replicate and perhaps boost the psychedelic drugs experiences. This evolved during the midst of 1960s among blues rock and also folk rock music bands in Britain and the United States. Psychedelic bands broadened their musical creativities and as well proceeded to create and consequently impact lots of new musical genres such as synth rock, progressive rock, kosmische musik, heavy metal, jazz rock, glam rock, bubblegum pop, electro and funk. Psychedelic music was transformed in many type of neopsychedelia in the 1980s upward in psychedelic hip-hops and also re-emerged in digital music in genres such as “New Rave”, “Acid House” as well as “trance music”. There are several features that are usually employed in psychedelic music. For instance unique instrumentation, with certain fondness for the tabla and sitar are popular, however Songs often times have more sophisticated song structures, modal melodies and drones, key and time signature changes compared to present-day pop music. Surreal, whimsical, literary-inspired or rather esoteric lyrics are generally used. Moreover, there is usually a firm focus on extended instrumental jams or solos, which basically features a considerably distorted electric guitar being the principal instrument. Electric guitars are widely used to produce feedback, as they are played by using fuzzbox effect pedals and wah wah. In the 1960s, there was a highly effective keyboard presence, this particularly making use of electronic organ, the Mellotron - an early tape-driven 'sampler' keyboard or harpsichords with complex studio effects are oftentimes used, for example, panning, extreme reverb, long delay loops, backwards tapes, and phasing. There was a use of traditional electronic instruments like the Theremin and early synthesizers. Psychedelic bands frequently used different recording methods and also effects, drawing from non-Western alternatives including the drones of Indian music and ragas. In the late 1960s and before declining in the early 1970s, Psychedelic has had impact on rock, folk, and soul music which gave rise to subgenres of psychedelic rock, psychedelic folk, psychedelic soul and psychedelic pop. 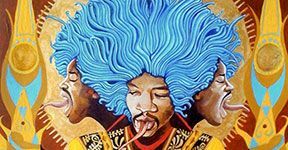 There are over 200 great psychedelic rock albums of the late '60s and early '70s, based on popularity, impact on psychedelic music and rock music in general. The initial usage of the word "psychedelic rock" can be linked to Austin, Texas band, The 13th Floor Elevators, whose early on tours motivated San Francisco's still-incubating psychedelic world. In the mid-1960s, the Beatles launched several of the leading portions of the psychedelic sounds to traditional audiences, such as "I Feel Fine" - 1964; guitar was used for feedback etc. George Harrison, on their 1966 “The Rubber Soul album” had the sitar present on "Norwegian Wood" and they utilized backmasking on single B-side "Rain" as well as other tracks that came out on their Revolver album later the same year. Furthermore, Drug mentioning start showing up in their songs, in "Day Tripper" - 1965, but more openly in the "Tomorrow Never Knows" -1966. Also, the first musical uses of the word "psychedelic" in the folk world was by the New York-based folk bank - The Holy Modal Rounders on their type of Lead Belly's 'Hesitation Blues' in 1964. In early 1960s, Folk guitarist, John Fahey produced so many songs experimented with extra-ordinary recording techniques comprising backwards tapes, unique instrumental accompaniment such as sitar and flute. His nineteen-minute "The Great San Bernardino Birthday Party" “anticipated some factors of psychedelia with its odd guitar tunings and nervy improvisations ". Folk artists who were especially important in the psychedelic movement like the Scottish performing artist, Donovan, who blended the impacts of American artists just like Bob Dylan with commendations of flower power, as well as the outstanding String Band, who from 1967 combined a variety of effects into their traditional acoustic instrument based music, which included eastern and medieval instruments. Late 1960s, Sly together with the Family Stone pioneered the genre of psychedelic soul. During the same period, psychedelic music started having great influence on African-American music artists, especially the superstars of the Motown label. Contingent upon the civil rights movement, psychedelic soul musicians even had more political advantage as against much acid rock. Building on the funk sound of James Brown which was pioneered by Sly together with Family Stone created songs such as "Everyday People, 1968”, "Dance to the Music, 1968”, "I Want to Take You Higher, 1969” as well as The Temptations with "Cloud Nine, 1968”, "Runaway Child, Running Wild – 1969”, etc. Much of pop-oriented psychedelia was loved among the emerging musical groups in New Zealand and Australia, just like The Easybeats, which started in Sydney however, created their international hit - "Friday on My Mind, 1966” in London. They stayed there and had their forays into psychedelic-tinged pop before they disbanded in 1970. Also, The La De Das, created psychedelic pop concept album - The Happy Prince of 1968, influenced by the Oscar Wilde children's classic, who tried unsuccessfully to break through in Britain. 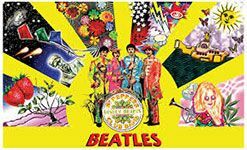 While psychedelia evolved just as the mainstream and commercial forces, notably by means of the work of the Beatles together with the Beach Boys, pop music started to be influenced; therefore, sounds of tape effects, fuzz guitars and sitars were included in pop music. Nonetheless, The Beach Boys were exceptional for their vocal harmonies. Their 1966 single "Good Vibrations" was among the first pop music to combine psychedelic sounds and lyrics using a Tannerin – a much simpler to operate model of Theremin. Also, the American pop-oriented group that adopted their style mixed Strawberry Alarm Clock, Blues and Electric Prunes.